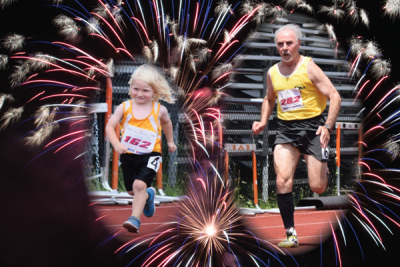 It is a concept that has driven the Empire State Liberty Tour Track & Field Series for more than a decade, and it became the foundation for the infrastructure of the Liberty Games, now the new state games, which just brought its 5th year to a close on Sunday, July 17th. What is “IT”? 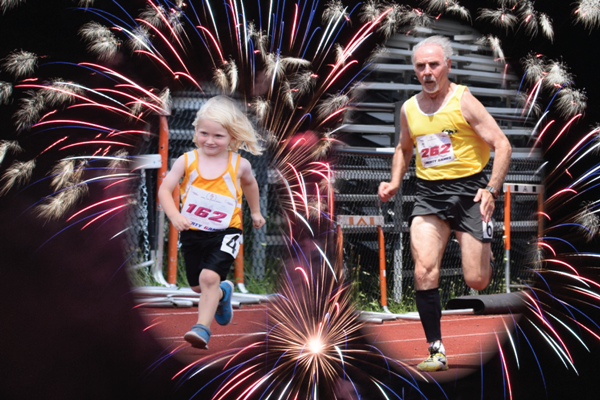 “IT” is the growing number of Age Divisions that are contested at various Liberty Games competitions. The Liberty Games first launched in 2012, and so 2016 was the 5th year of this annual sports event, which draws Athletes from around the state, and in some cases the Northeast, pending the sport being contested. “Our goal is to get people moving!”, exclaims the Director of Sports Medicine for the Empire State Sports Council, Dr. John Ferguson. He continues, “We want to see Children develop good exercise habits at an early age, so that they can continue to enjoy moving when they enter their Senior years.” One does not need to look too hard to find evidence of that, as the youngest competitor this year for Track & Field was three (3) year old Jacob Goodrich (Pictured Above from Chatham Gold), and the eldest competitor, by age only, was Dominic Rappazzo, now 75 years young (Pictured Above). Both are shown competing the 100m Dash at the Liberty Games, and Dominic set a new Liberty Games Record with a time of 15.22 seconds! “I believe that one thing that separates the Empire State Sports Council from other ‘similar’ competitions”, according to Track & Field Sports Chair Shannon Gawronski, “is that they have figured out a way to make exercise a Family Adventure, which includes Children, Parents, and even Grandparents all at the same time!” This is certainly true, as Jacob Goodrich has a Sister, a Brother, his Mom, and even extended Family (Uncles and Cousins) that also compete at the same time. The events in which they participate range from the 100m Dash to Long Jump to Steeplechase to Javelin, and much more. 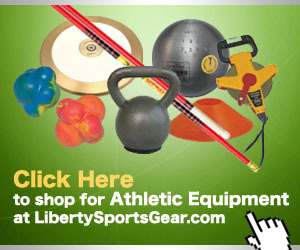 For all of the Results from the Liberty Games Track & Field Championships, click on “Liberty Games” from the navigation bar, then Click on “RESULTS”. From that page just click “Track & Field”. 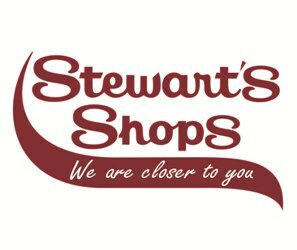 For the updated Records for the Liberty Games Track & Field Championships or the Liberty Tour, Click on “RECORDS” from the navigation bar, and select the meet for which you would like to view the Records.